History : 01/1997 : Acquired with monitor for $29.00. 08/29/98 : Acquired original "chicklet" keyboard & Kings Quest overlay for $2.92. IBM PCjr BASIC manual for $0.90. 09/19/98 : Acquired system for $6.50 and $1.60 for the PSU. Also picked up the PCjr Tech Ref and PCjr BASIC manual for $1.91 each. 12/05/98 : Acquired system with top side second drive for $9.09. 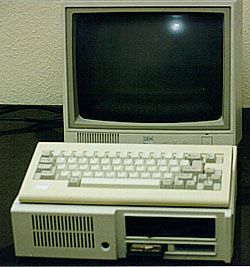 This was IBM's attempt to make it in the home computer market. Introduced in 1983, it was withdrawn in 1985.